Most people I know have a healthy respect for electricity. If you know a little something about it, chances are you will have friends, family members or acquaintances asking you to come over and look at this, fix this, explain this, etc. Most of today’s modern conveniences revolve around electricity at some point: lighting, appliances, air conditioning, heating, computers, cell phones…the list goes on and on. Harness its power and have a great resource at hand; misuse it and start a fire, hurt yourself, or kill someone. Today’s article features a job that comes up when DIY and Home Improvement enthusiasts have an upgrade to their existing property or are adding an addition. 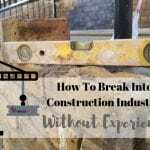 Now, this is also experienced in new residential and commercial construction, but we need to narrow the scope of this article a bit, so I am sticking around the house for our topic today. 2 Easy Task … Hard Task? 3 What Tools Do We Need To Get The Job Done? Turn off power in the immediate work area; double-check!! Locate ceiling light fixture and wall top plate (2×4) in the attic. Drill wall top plate (2×4) for Romex cable. Place fish tape on a weighted string down wall opening. Cut hole in the wall for the new receptacle. Attach Romex cable to fish line, pull the cable up to ceiling fixture. Place receptacle box in the wall. Wire ceiling light fixture and receptacle by the diagram. Check all circuits with meter and circuit tester. Easy Task … Hard Task? It will be fairly straightforward if you are adding an addition. Your wall framing will be up, and the roof is on, so you can see the interior framing of the soon to be an addition. You can tell exactly where to place your receptacles, lights, and switches. A bit online research about basic electrical wiring should get you through ok. But an existing room is a different matter: all of the wirings is already enclosed in the walls. Maybe not the easiest job, but it can be done, and I hope to help you with that today. 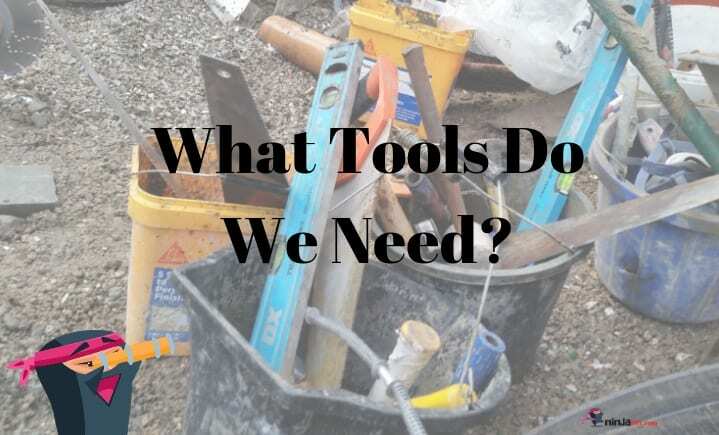 What Tools Do We Need To Get The Job Done? Depending on your room’s construction, you may also need a fish tape and maybe a laser level to make sure we have everything aligned perfectly. (I have an awesome list of great laser levels here.) A fish tape is a long spool of stiff wire to get electrical wires into walls that are existing and already finished. All the items listed above, with the exception of the fish tape, are fairly inexpensive. If need be, you may be able to borrow a fish tape from an electrician or rent one from your local DIY center or hardware store. Take a look at the room. Most rooms should have at least 1 overhead light fixture in the center; that will be our first focus. Hopefully, you have some crawl space overhead or an attic. If you do, that is super-great; half the battle is over. Take a look around in the attic; can you see the 2×4 top plates of existing walls in your home? They should be lying flat, and you may see holes drilled in them with wires coming in or out; that is where your existing electrical wires are for your home. We’re simply going to add another. You can also do this job if you want to rewire an existing receptacle. Just find the wire currently installed and rewire based on one of the diagrams below. So, we have tools, we have an overhead light fixture, we have crawl space in the attic. (If you do NOT have an attic, this job may still be possible if you have crawl space under your house. If neither, we can still accomplish the job with a surface mounted raceway; we’ll save that for another post. It may be 1 or 2 circuits; hopefully, your electrical panel is labeled. You can also turn on a light or radio in that room and flip the breakers off until you find the one that stops current to that area. Now you want to use your meter at the light switch and light fixture, and your circuit tester at any receptacles in the room to make SURE you have no current flowing in that room. Based on the way your ceiling joists run for this room, that is the direction for the location of your new outlet. The light fixture is attached to one of the ceiling joists; we want to simply run our Romex cable beside the ceiling joist in the attic, over the top plate of the wall where our new outlet is going. Take your drill with a fresh battery or run a drop cord from somewhere in the house where you still have current, and a flashlight or small lamp with you to the attic. If your attic is already wired and has light, all the better. CAREFULLY walk on the ceiling joist over to the wall where your new receptacle will be. It’s not a bad idea to take a piece of plywood to stretch across the joists to work from; you don’t want to stick your foot through the ceiling and earn yourself another DIY project!! Drill straight down through the top plate of the wall. It may be two 2×4’s, so take your time; you will know when you break through. Once that is done, stick your fish tape down through the hole as far as you can, hopefully reaching the floor. If you couldn’t find a fish tape, a strong string with a weight attached to it (try a nut from a small bolt) may work as well, especially if you are on an interior wall and there is no insulation to work around. Once back down in the room, take a few measurements and locate where your new outlet will be. Trace around the receptacle box on the wall, and carefully cut the section out. There are multiple cutting tools that will do this; the simplest—a box cutter with a sharp blade. With the hole cut in the wall, reach inside for your string or fish tape, and pull it out into the open room. Attach your Romex cable to end using black electrical tape, and make sure you have plenty of straight cable to pull up through the wall, into the ceiling and over to the ceiling fixture in the attic. Any of these steps will be easier if you have a helper, but it can be done solo. Leave about 12 inches of cable out of the receptacle hole you cut. Pull the Romex cable into the outlet box that you have in your hand, and gently work the outlet box into the hole you cut. There should be tabs on the outlet box for securing it inside the wall. Before you go back into the attic, remove the light fixture from the ceiling so the wires are exposed, and the fixture is out of your way. Head back to the attic, and just as before, push the end of the Romex cable into the box that houses the light fixture. Staple the wire along the ceiling joist using Romex wire staples. Once you are back in the room, strip the outer cover about 6 inches off both ends of the Romex cable. You should see the following wires: black, white, maybe red and bare copper wire. Strip each wire back ½ inch. I have attached a few wiring diagrams, based on your desired end. You do have some options. The top of the receptacle could power on when the light is switched on, or the receptacle can be wired to stay hot all the time, regardless of the ceiling fixture. Take a look, discuss with family members and decide which works best for you. Put your wires together based on your need and the following diagrams. Twist the wire nuts tightly over the bare ends of the wires securing them together. Some people will even add electrical tape to the wire nuts; it’s ok, but not necessary. 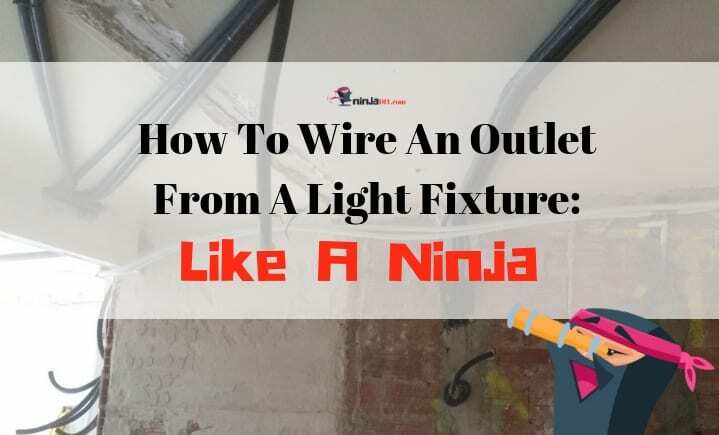 Be sure to attach the bare ground wires to the other existing bares wires, or to the green grounding screw on the receptacle and ceiling fixture. Carefully tuck everything back into the receptacle box and the ceiling fixture box; fasten securely with screws and place the receptacle cover over the new receptacle. Go to the electrical panel and turn your breakers on. Flip the light switch; hopefully, the light is on. Use your circuit tester for the receptacle; plug it in the bottom and top outlet. A series of lights will tell you if the circuit is wired correctly. Hopefully, it is, but if not, the tester should help you solve the issue easily. Hope you liked today’s post and especially I hope it helped you in some way. And remember, if you’re not confident enough to go ahead with any DIY task … that’s fine. I am not confident with all the DIY tasks either. But one advice I can give you though … is this. If you have any doubts … just let the PROS to do it for you. Check out these guys at Networx, where I’m sure you can find a good professional to do those jobs that you’re not 100% confident in your DIY skills. Let me know your thoughts in the comments below, please. 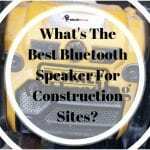 Builders: Wanna Know What's The Best Bluetooth Speaker For Construction Sites? Green Laser vs Red Laser Level | What Is The Difference?